Part of my preparation for cooking this pasta was to check other restaurants’ puttanesca–Pizza Hut’s and Bigoli’s–aside from Friuli Trattoria’s to make sure I get the right taste of it. During my food testing, I realized that I don’t like those green stuff called capers so I vowed to look for a puttanesca recipe online that didn’t include capers on its ingredients. The Pioneer Woman’s recipe was the answer to my prayer. Contrary to puttanesca’s rumored origin, some of its ingredients are quite expensive, at least in the Philippines, like the olives and olive oil. So just like in my Project Cocina de Camilla #1, I made a lot of alterations here, too, either because some of the ingredients on my recipe source were too hard to find or I simply didn’t like them. The biggest change was increasing the amount of the ingredients by a hundred percent of those prescribed on The Pioneer Woman’s recipe. This was because my Mom told me the night before cooking that the serving suggested on the recipe wasn’t sufficient for a family with a monstrous appetite likes ours. Well, I got her point so I followed her. 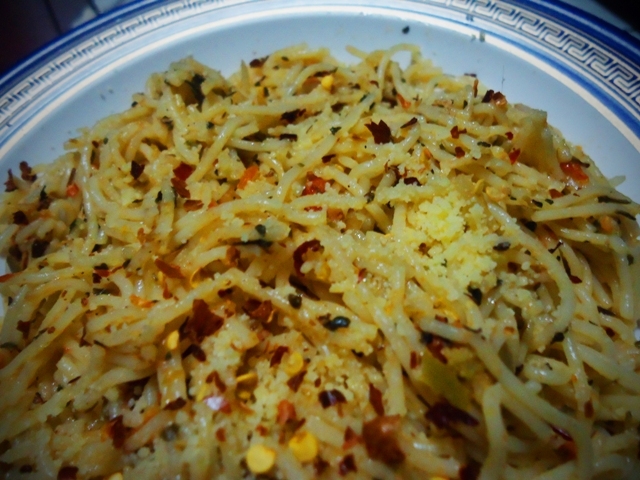 While cooking this, I found out that pasta-making is easy albeit the preparation is quite long. I got a little bit nervous only because hey, it was my first, and with the modifications I made, who wouldn’t feel butterflies in their stomach? The next instruction goes, “Mash (in this order) garlic, [tuyo], and olives using a mortar and pestle,” but since the tool available at home is small, I ground only the garlic and tuyo first, placed them on a plate, then crushed the olives separately. I mixed all the three up on the plate. I then poured the broth and stirred for a couple of minutes. When I thought that the sauce was finally okay, I added the pasta and mixed everything with all my might (500g of pasta was a lot, I learned! Mixing it was tiring!). As I was stirring for already a couple of minutes, I began to feel disappointed because my pasta had yet to achieve the same color as with that of The Pioneer Woman. I didn’t stop though. I sprinkled some parmesan cheese on it but stopped when I realized it won’t be enough. I’d just have those who would eat put some on their plates themselves. I also sprinkled generously the basil leaves I bought (No, not whole leaves as instructed, but pounded since whole ones were nowhere to be found on the supermarket.). Then I kept stirring to make sure the sauce and the pasta got mixed up well. After that, that’s it. The whole time I was cooking, my Mom kept on going near me to comment on the heavenly aroma of puttanesca and check what I was doing. She was actually the first one to notice that my puttanesca looked dry, but still, when she had a taste of it, she instantly loved it! At first I didn’t want to believe but when my brother tried it, he loved it, too. In fact, he had another plate right after the first and even bought a liter of coke for it. My sister also had two rounds of it the next day (She went home very late when I cooked because of her OJT, thus, “the next day”.) and also said it was delicious. WHOA. Of course, I ate too and though it was indeed dry, it did taste puttanesca. 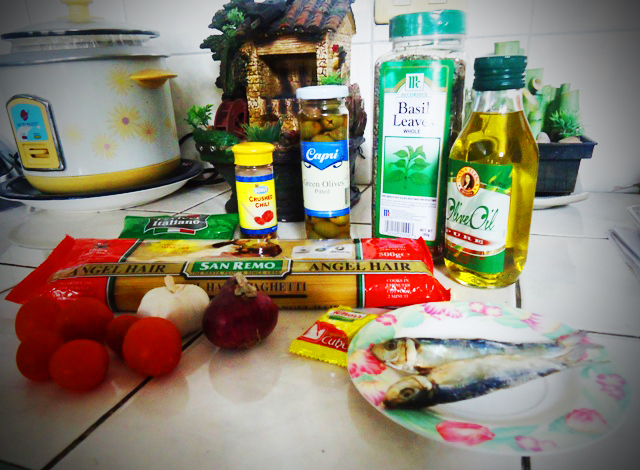 The ingredients couldn’t be denied, especially the olives, albeit I only used 1/2 cup of it instead of 1. The crushed chili I bought was sprinkled by the eaters to their plates depending on how spicy or not they wanted their pasta were. This made the taste of the puttanesca better. Along Maginhawa St, Teacher’s Village in Quezon City is a restaurant with the best puttanesca I’ve ever tasted. But wait, what is puttanesca? In the Philippines, I find some people who bleep its first two syllables because it sounds like the first two syllables of probably the worst Filipino swear term. I find this act weird and irksome, but I just discovered that they were somewhat right in doing so since they really mean the same thing. Puttanesca, or spaghetti alla puttanesca, is the name of an Italian pasta which literally means “whore’s style spaghetti” (Yes, it’s the “whore” part that people censor). There’s no definite reason as to why it is called such, but one of the hearsay has it that it smells like the cheap meal prostitutes serve their customers back in the day. Anyway, this pasta is made up of black olives, garlic, tomatoes, onions, anchovies, and olive oil. 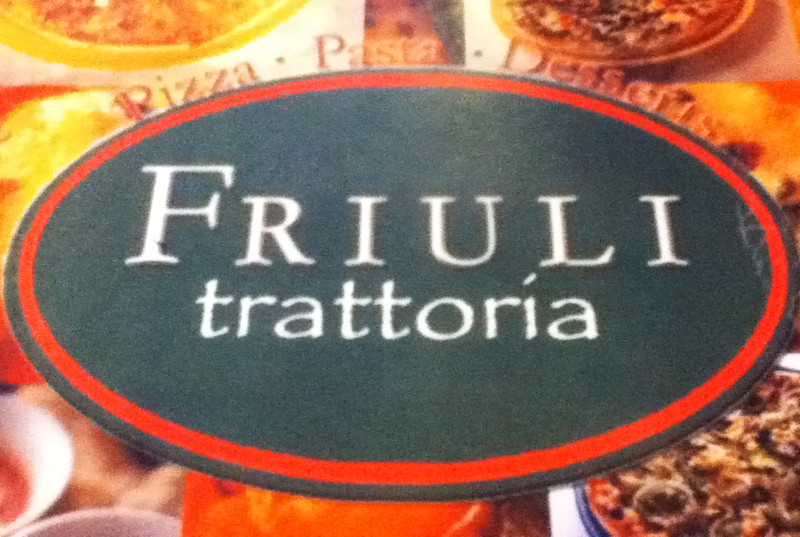 I’d been hearing and reading the said dish on restaurant menus, but I used not to care what it was until my friend suggested we eat at Friuli Trattoria, a small restaurant that serves affordable yet definitely yummy Italian dishes, when we were in Maginhawa St, Teacher’s Village in Quezon City. With the words “Angel” and “Hair” just before the magic word, the name finally caught my fancy so it was what I ordered. And oh boy, I didn’t regret my choice! 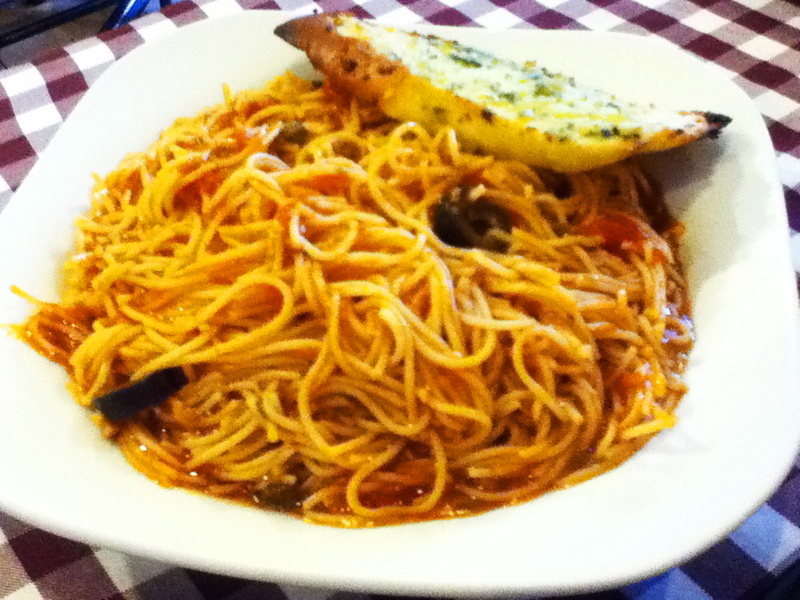 The restaurant’s version of puttanesca has the usual tomatoes, capers, anchovies, and olives, but instead of using spaghetti, its pasta is capellini, a variety of Italian pasta similar to spaghetti, only thinner, and I believe better, thus, the term “angel hair”. I’m not a fan of pasta ’cause I’m more of a rice person, but this one became my instant favorite. Its sauce is poured generously enough making me savor every mouthful of its rich flavor, in fact, I could distinctly taste the deliciousness of anchovies (I love seafood!). I also think choosing angel hair as its pasta has to do with its supreme taste, you know, the thin strands give way to experiencing more of its sauce than the pasta itself, which is truly celestial. Just a theory, though. It’s affordable, too. 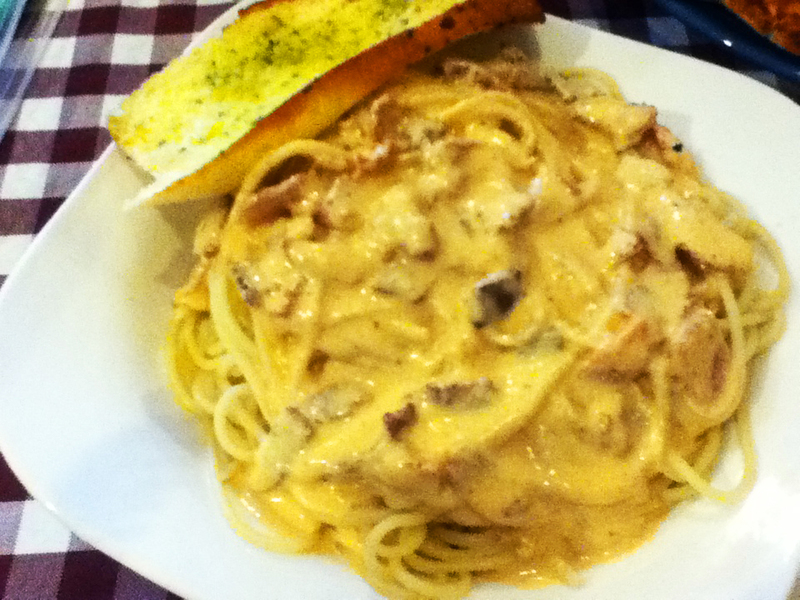 For only 130 pesos, an order, served with a slice of garlic bread, is already good for two persons. 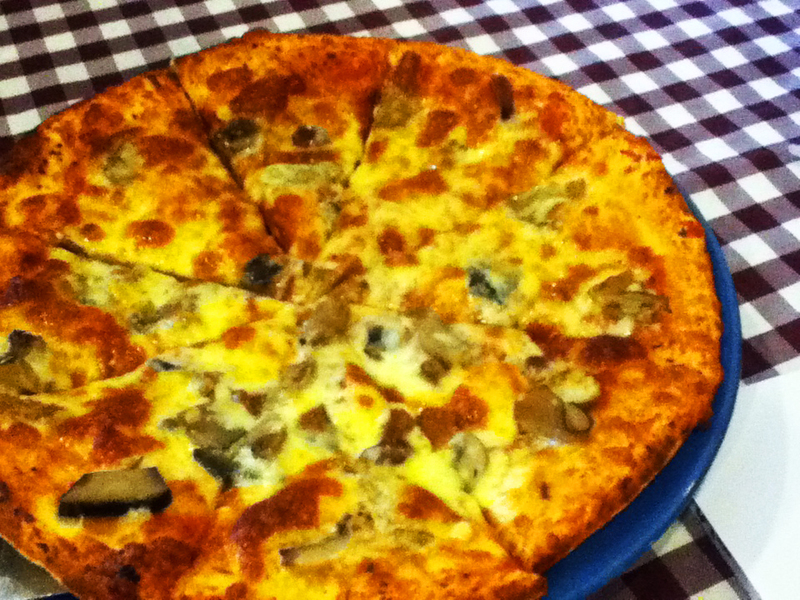 Our other two orders were Spaghetti Carbonara, served with a slice of garlic bread, too, at the price of 130 pesos for my friend, and an eight-slice Mushroom Pizza, which comprises of four different kinds of mushrooms (My favorite!) for only 185 pesos for both of us.